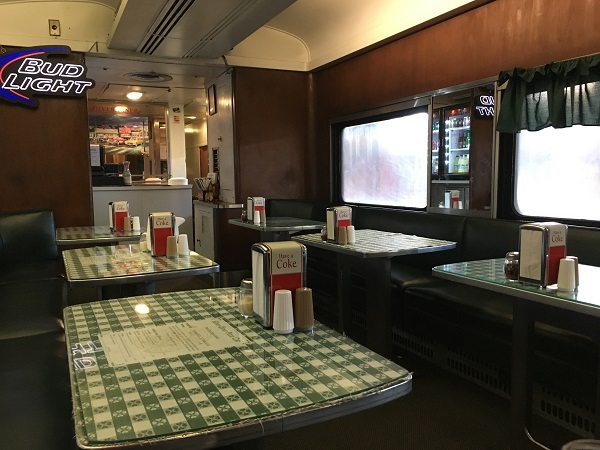 Last Call for Boarding on the Pizza Diner – Marie, Let's Eat! A couple of weeks ago, we reached an incredibly weird little milestone for our blog. Sadly, we’ve eaten at many restaurants that have closed after we’ve eaten there. But never before – and, we hope, never again – have we eaten at a restaurant that closed while we were eating there! 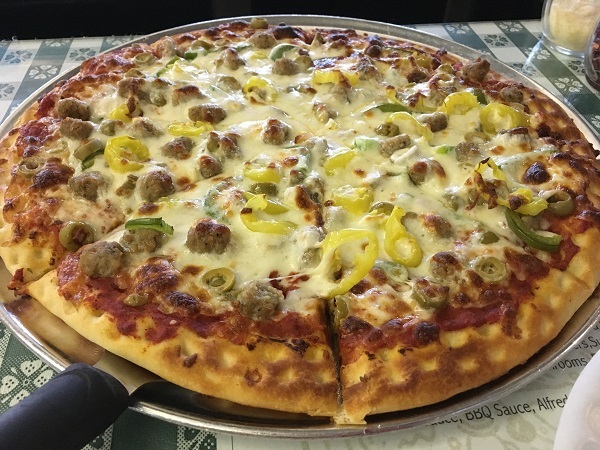 Since we’re always on the lookout for restaurants that sound like they’d make great stories, I was interested to learn about a pizza place that we’d driven past dozens and dozens of times without ever knowing it was there. 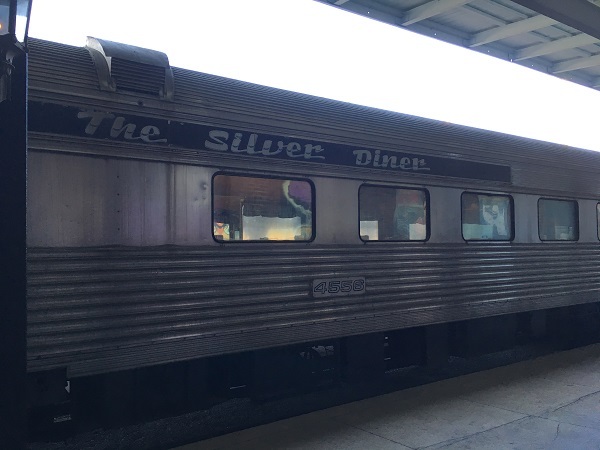 The Silver Diner Pizza Car is – or was – part of the Chattanooga Choo-Choo complex. 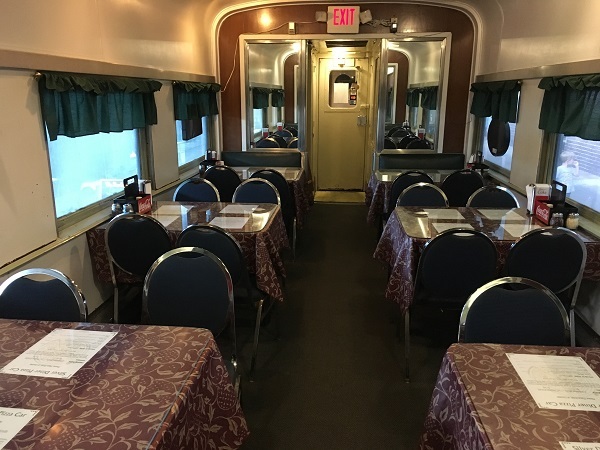 It was set up in an old diner car from the 1950s. If you’ve never visited this curious tourist place, it’s a hotel set up in what had been the Terminal Station, a gorgeous building from 1909. As we’ve mentioned here before, Chattanooga is undergoing a slow but steady renovation from a long, long decline in the middle of the last century. When passenger trains stopped coming to Chattanooga in the 1960s, at the same time that the smog and filth from the foundries became barely breathable, that was rock bottom. Terminal Station closed in 1970 and sat boarded up for most of four years. Following a massive investment and renovation, it reopened as a pretty beautiful hotel with shopping and restaurants. Today, it’s home to a comedy club, a performance space and museum of guitars, and, until a couple of weeks ago, a pizza place. The pie here was serviceable, not great. They were having a big sale when we arrived. A 12-inch pie normally ran $11 with toppings $1.50 apiece, but they were offering an eight-topping pie for ten bucks. So we got our son a personal pepperoni pie and ordered ourselves one with sausage, olives, and a couple of peppers. Drinks were canned, and the train car was quiet. There were two other diners, hotel employees, each quietly having their supper. We got our pie just after six, and then got to witness the incredibly uncomfortable and awkward scene of another family coming in behind us and the fellow at the register apologizing, that they were closing early and not serving anymore. And they did not serve again. Back in the earliest days of our blog, we visited the old Varsity Jr. on one of its final weekends, making a pilgrimage to a much-loved space that was shutting down. Later on, there was Bastie Boys BBQ in Buford, which closed its doors literally two days after our story went up. And I’ll certainly never forget the Colonel’s Mini Mart in Henderson KY, not just because that was the best fried chicken I’ve ever had and not for its long and storied history – it was once the celebrated Bon Ton – but because I hadn’t had time to write the story before it shut and the post became an obituary. One of the hotel’s employees told me on the Tuesday that the restaurant had shut down. I thought she must have been pulling my leg, so I confirmed it with the front desk the next day. That Saturday night was the last one. I sincerely hope nothing like this ever happens again. That’s cute that we can claim to be a restaurant’s final customers, but once is enough. We want small restaurants to stay open! Posted on October 14, 2017 by Grant G.Posted in chattanooga, goodbye, pizza, tennesseeTagged chattanooga, closed!, pizza, tennessee. We came close to being the final diners at Spaghetti Warehouse on Delk Rd in Atlanta/Marietta. We had gotten out of our car to have lunch there when a gentleman came out of the restaurant and taped a sign on the door stating the restaurant was permanently closed. Very strange experience considering we couldn’t go in yet people with to go boxes from their lunches we’re walking out the door. They closed during lunch? That’s even weirder than our experience! My family inadvertently found ourselves among the last diners ever served at the Old Spaghetti Factory on Ponce in Atlanta when we showed up on their final night. We were there for a birthday celebration, but that news put a sad spin on the occasion. How strange! How Sad! I can’t say the same has happened to me, but I’ve had several personal favorites close forever from construction. Not sure if there were ever any locations here in the South, but I used to work at a York Steak House (similar to a Ponderosa or Sizzlers) in the late 1980s in RI that suddenly shut down. Although rumors were circulating, we were told about the closing the day of the shutdown. Restaurants reveal the closings to their staff as late as possible to avoid no-shows and stealing. We actually worked a few more days after the closing to clean up the store and transfer whatever leftover stock we still had to a neighboring store in MA that was still operating. That one too would soon close though. What happened to Grant? No posts for 3 months? Thanks for asking! We haven’t gone anyplace new or traveled lately, but we have a couple more stories to tell in the months to come.